Have you ever had moments where your breath is suddenly cut off? It is similar to when you eat or drink something that feels like it went down the wrong way. An episode of laryngeal spasm is a terrifying experience, to say the least. Not being able to speak or breathe properly only lasts for a very short time, but frequent episodes can have lasting damage on the esophagus. We will look into how these spasms occur, the signs of laryngospasm, laryngeal spasm symptoms, as well as treatment and prevention tips. 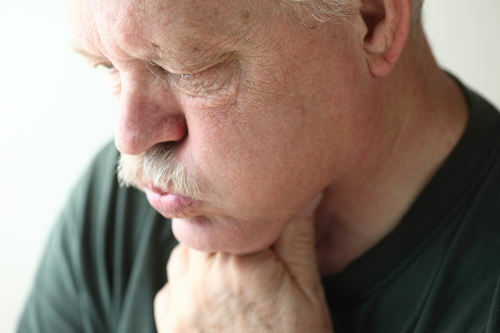 What Is Laryngospasm (Laryngeal Spasm)? Laryngospasm refers to the sudden, momentary closing of the vocal cords, which is caused by a brief blockage of the airway when you inhale. Since this involuntary spasm of the vocal cords prevents air from entering the lungs, you experience a moment of not being able to talk or breathe. Our vocal cords lie within the voice box, known as the larynx, and open when we take in a breath. A spasm prevents air from flowing through the larynx. It can also be a symptom of laryngopharyngeal reflux and gastroesophageal reflux. What Causes Laryngeal Spasm (Laryngospasm)? Since there is no specific cause associated with laryngeal spasms, we have to focus on the triggers that can cause this reaction. Airway hindrance is a common result of any respiratory reaction such as smoke, allergies, dust, fumes, stress, and asthma triggers. Laryngospasm is often a by-product of gastroesophageal reflux, referred to as GERD. It is a condition where the lower esophageal sphincter muscle does not properly close as it should after food passes into the stomach. When it is weakened, digestive juices and food backtrack up into the esophagus. Frequent episodes of this will damage the walls of the esophagus and cause inflammation. It is such damage that leads to the involuntary spasms of the vocal cords. Another condition linked to these spasms is laryngopharyngeal reflux. The regurgitation can quickly damage the tissue of the larynx. As a result, a respiratory illness such as a common cold can exacerbate the condition. You are at a high risk of developing laryngospasm with the use of anesthesia for a surgical procedure. The substances used can irritate the entire throat region. It can be a frightening experience to wake up in the dead of night fighting to catch your breath. It may feel as if you are suffocating during an episode of sleep-related laryngeal spasm. Unfortunately, it is a common occurrence with GERD, and it can be so severe that a person may lose consciousness. Once you are able to breathe again, a high-pitch squealing sound, known as stridor, will emerge from your airway. Your airway will open, and regular breathing will start. Although a laryngospasm only lasts 30 to 60 seconds, it can seem like an eternity. Many laryngeal spasm episodes have an association with GERD symptoms. These may include heartburn, nausea, coughing, chest pain, difficulty in swallowing, soreness in the throat, or hoarseness when speaking. Since various health conditions usually trigger the spasms relating to this condition, laryngospasm treatment focuses on the source. For example, if you are experiencing GERD, there are medical treatments using proton pump inhibitors to reduce stomach acid and alleviate regurgitation. Another way to eliminate the amount of acid to prevent the spasms is with the use of prokinetic agents that stimulate the intestines to move. If you have laryngospasms frequently and are not using any form of treatment, whether it be medical or preventive to help curb the episodes, surgery may be required. Doctors will perform an operation called fundoplication. It involves wrapping the upper curved portion of the stomach around the esophagus and sewing it into place. The procedure firmly stabilizes the lower part of the esophagus through the stomach muscle to prevent stomach acid from rising. Another surgical option is placing a titanium ring around the lower portion of the esophagus. There is no guaranteed treatment for this condition, so the best laryngeal spasm treatment is prevention. Do not eat two to three hours before bedtime. Avoid heartburn and allergy triggers. Limit alcohol and caffeine products. Prop head up when laying down or sleeping. Laryngospasms may be a living nightmare, but thankfully, episodes are short-lived and stop on their own. Frequent bouts of the spasms can be the result of an underlying health condition such as gastroesophageal reflux, or GERD for short. Symptoms of GERD and other triggers that stimulate the respiratory system need to be directly treated to help stop or prevent laryngospasm. Lifestyle changes and avoiding triggers may help in preventing laryngeal spasms. Kerkar, P., “What Causes Laryngospasm or Laryngeal Spasm & How Is It Treated?” ePain Assist; https://www.epainassist.com/face-mouth-throat/what-causes-laryngospasm-or-laryngeal-spasm-and-how-is-it-treated, last accessed May 4, 2017. “Laryngospasm,” WebMD, August 21, 2016; http://www.webmd.com/heartburn-gerd/guide/laryngospasm-causes-symptoms-and-treatments#1-2, last accessed May 4, 2017. Rosenow, E., “What Causes Laryngospasm?” Mayo Clinic, November 18, 2014; http://www.mayoclinic.org/diseases-conditions/gerd/expert-answers/laryngospasm/faq-20058269, last accessed May 4, 2017. “Laryngospasm,” Healthline; http://www.healthline.com/health/laryngospasm#overview1, last accessed May 4, 2017.